Lumax Lighting: "Great American Lighting Fixtures Since 1976"
Lumax Industries manufactures the highest quality, Made In USA commercial and industrial lighting fixtures. 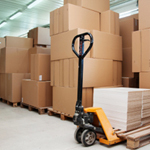 We produce specification grade LED luminaires for retrofits, renovations and new construction lighting projects. We also specialize in custom designs and modifications and proudly design and manufacture in Altoona, Pennsylvania. New CNRLED Applies Aisle Light Right! Lumax Lighting is pleased to introduce the all new CNRLED luminaire especially designed for aisle lighting warehouse spaces. 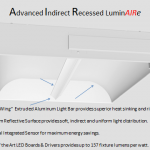 Lumax Lighting Announces release of the new, innovative AIR Advanced Indirect Recessed luminaire. Lumax Lighting is proud to introduce the high performance AIR LED Luminaire. The AIR (Advanced Indirect Recessed) LED Luminaire outshines other recessed lighting fixtures in performance, aesthetics, efficacy and control.